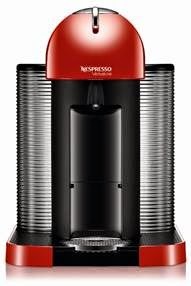 The new Nespresso VertuoLineTM revolutionizes the way that coffee is brewed. It is awesome! The result is a new richly aromatic, deeply flavored, crema-topped large-cup coffee (8 ounces) or espresso. For the first time ever, coffee lovers can experience large-cup coffee with crema. Love it! Our eBOX 2-in-1 coffee or espresso pod brewing device does the same and you'll save a lot of money and help the environment too!